Evander Holyfield, born on October 19, 1962, in Atmore, Alabama. Often referred to as "the Real Deal", Holyfield is known for being a four-time world heavyweight champion. Growing up in Atlanta, Georgia, he took boxing lessons as a child. He competed as amateur in the Golden Gloves competitions in the early 1980s. After winning a national Golden Gloves Championship in 1984, Holyfield made the U.S. Olympic team. Proud to represent his country at the 1984 Olympics held in Los Angeles, he experienced a great disappointment in the ring. He was disqualified during a semifinal match against Kevin Barry of New Zealand for hitting his opponent after a break. Many who witnessed the fight have disputed the referee's call. Despite this personal setback, Holyfield did receive the bronze medal. After the Olympics, Holyfield turned professional and first fought in the junior heavyweight and cruiserweight classes. He won the World Boxing Association's (WBA) World Cruiserweight title in 1986 by defeating the reigning champion Dwight Qwai. Holyfield trained hard to become big enough and strong enough to compete as a heavyweight fighter. In 1990, he became Heavyweight Champion of the World, defeating James "Buster" Douglas, the holder of the WBA, International Boxing Federation (IBF), and World Boxing Council (WBC) championship titles. Holyfield took out Douglas in only seven minutes. Holyfield's intense rivalry with boxer Riddick Bowe began in the early 1990s when he suffered a big defeat to Bowe in 1992, losing his title. It was his first loss in twenty-nine professional fights. After briefly contemplating retirement, Holyfield was back in the ring and anxious to reclaim his title. He did just that when he got his rematch with Bowe in 1993, winning by decision. Holyfield didn’t hold on to his title for too long. The next year Michael Moorer defeated him by decision. Health problems sidelined the famous boxer for a time, but he returned to the ring and eventually fought one of the most notorious boxers in history, Mike Tyson. Holyfield beat Tyson in their first encounter in 1996, winning the WBA championship. No one could have imagined what happened in their next fight, however. During the bout, Tyson bit Holyfield twice on the ear—the second time he took a piece out of Holyfield’s ear. Tyson was disqualified, and his odd behavior in the ring became international news. Holyfield, a deeply religious man, forgave his opponent. Several months after this incident, Holyfield took back his IBF title from Michael Moore by knocking him out in the eight round, making it his third separate title victory. In 1999, Holyfield took on another legendary fighter Lennox Lewis, the holder of the WBC heavyweight title. The first match between these two heavy hitters ended in a draw, but Lewis emerged victorious in a rematch later that same year. Holyfield went on to win his fourth championship in 2000, unseating the WBA champion John Ruiz. This victory was short-lived, however. Ruiz beat Holyfield in a rematch the next year. Holyfield continues to box. Proving that he is still a contender, he beat Jeremy Bates by a knockout in August 2006—his first fight in nearly two years. With his boxing career slowing down, Holyfield has been exploring other business opportunities. He attracted a lot of attention for his footwork, not his punches, appearing as a contestant on Dancing with the Stars, the television competition that teams up celebrities with professional dancers in 2005. Off stage and out the ring, Holyfield devotes some of his time to helping young people. The Holyfield Foundation supports numerous programs for inner-city children. He lives in Atlanta, Georgia. 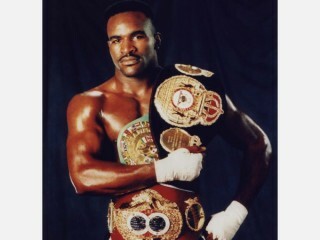 View the full website biography of Evander Holyfield.